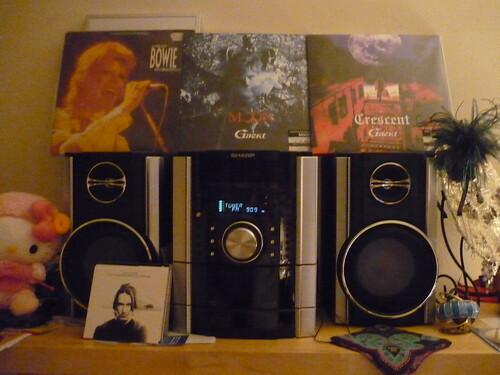 I am also probably one of the only people under 40 who actually owns a 5-cd changer stereo in addition to an iPod. Oh, and a best of David Bowie LP set. With a knitting Hello Kitty. With Greek pop cds. With feather fascinators. And mountain biking gloves. My new Janome sewing machine! I sold my trusty Singer on craigslist to someone who needed it more than I, and upgraded to a machine that’s a lot more heavy-duty and can work with the weird projects I’ve been making lately. Seriously seeing this on my doorstep was the highlight of my Friday.